Well, if he's surfing, you and your camera must be surfing on the leaf right behind him! He does look like he is surfing. Lovely little critter Misty. What a Beauty. He really is. I cant wait to see a few not many but a few soon . Great critter and capture, Misty! Happy weekend! Wonderful shot, Misty. I think he's surfing, too! :D :D Happy Critter Day and thanks for hosting! It's a great photo...but I didn't think surfing. However, I can truthfully say I NEVER think surfing...it is a nice shot of the grasshopper. I immediately thought of Kung Fu...of course I guess I just dated muyself! Hummm...I go on photo safaris, you go on surfin' safaris. Yes..there are some issues there...somewhere...hehe. Sweet shot, Misty. Love the colors. A great closeup of the 'surfing' grasshopper! NIce shot! 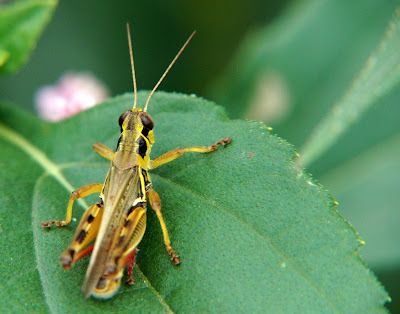 Later in the Spring, we have these huge grasshoppers here (in Florida)called lubbers. They're so big they're kind of scary. Thank you for hosting CC. Great shot of the 'surfer'! I think that stroke is called the "bug paddle"! What a colorful grasshopper. I usually see the brown boring looking ones. A Beautiful Hopper!! I'm getting Spring FEVER and really miss these little guys! !